Labinprogres-TPS exhibited at the 40thInternational Fair of Agricultural mechanization EIMA in Bologna, Italy, from 07 to 11 November 2012, together with members of the Agricultural Equipment Cluster, companies: Eurometal Ltd., Hittner Ltd., Megametal Ltd., Hydraulics Quince and POD Ltd. Dežanovac. The exhibition was organized under the sponsorship of the Croatian Business Commerce Chamber, Ministry of Business and Trade and Ministry of the Economy. Historical record with over 196.000 visitors and an increase of 22% of foreign exhibitors confirm the importance of this event in the sector of agricultural machinery. 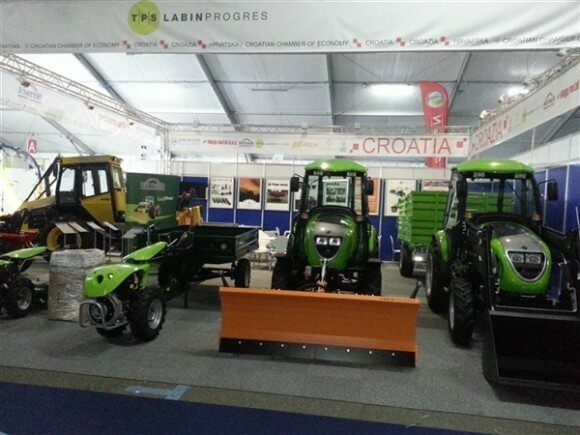 The great interest of visitors for Labinprogres mechanization and agricultural machinery of other Croatian producers and established important business contacts suggest a very successful presentation of the Croatian agricultural machinery at EIMA.